Say “continuous improvement” and other professionals familiar with concepts like Total Quality Management, Failure Modes and Effects Analysis, Quality Management System, Plan-Do-Check-Act, or Six Sigma will, or should have complete understanding of your meaning. They should have productivity improvement, waste elimination, increased profitability, and creation of wealth as combined, expected results of continuous improvement. Enter a critical concept with which some may not be as familiar: Kaizen. It is Japanese and it implies continuous improvement. Preparing for Kaizen, or in particular, Kaizen events, or blitzes, is most effective when it is equipped with an experienced team of at least one member — better if there are multiple members — who have previously experienced a Kaizen event, a black belt certification exam, green belt certification exam (primary and secondary proficiency in six sigma, respectively), and are familiar with lean manufacturing, value stream mapping and lean six sigma. Kaizen is synonymous with continuous improvement. A direct English translation is “to break for the better,” or, in other words, a “good change.” Change is always good, right? Unfortunately, it is not. If a planned change occurs, it may still not result in process improvement. If it is not planned, chances are it will degrade the process. 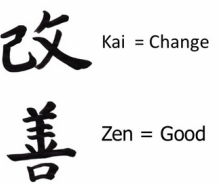 Kaizen “change” must imply improvement. Kaizen is not a comprehensive, long-term improvement plan. It is a deliberate, but gradual progression of a series of steps; all of which cause process improvement. Kaizen is increased productivity, waste elimination, lean manufacturing, and lean six sigma, but they are efforts taken in small, deliberate, planned and more easily implemented events. A Chinese philosopher, Laozi, once said, “A journey of a thousand miles begins with the first step.” This means not only that every journey of whatever length has a beginning; it also implies that every difficult venture is made easier by dividing the effort into incremental steps. This philosophy perfectly aligns with the effort of Kaizen, which means that every step taken improves the effects of the journey. As said, it is a journey of lean manufacturing and lean six sigma. Kaizen uses deliberate tools that guide and shape improvement; tools like 5-Whys and Value Stream Mapping (there are others), in exercises known as “events” or “blitzes” designed specifically in gradual increments of change that do not require a significant expense. 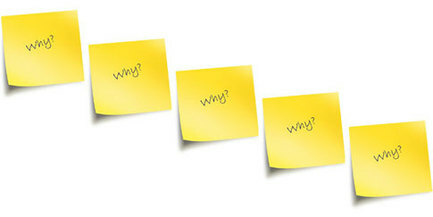 One essential type of event is “5 Whys.” When presented with any problem hindering a process, ask a series of five “why” questions, and find the answer to each question to reach a conclusion of root cause. Here’s a common problem: A critical customer order was not produced and shipped on time. 1. Why wasn’t the order produced and shipped on time? Answer: The factory floor did not have the order on its manufacturing schedule. 2. Why wasn’t the order on the manufacturing schedule? Answer: A manufacturing clerk’s training required that information from a blue copy of the purchase order be logged into the manufacturing schedule. A yellow copy was received and was routed back to Purchasing for the correct copy color. 3. Why did Purchasing send a blue copy to Manufacturing? Answer: A purchasing clerk understood by recent training that the distribution of a purchase order copy could be in any color to any department. 4. Why did Purchasing modify their purchase order distribution process to any color to any department? Answer: Purchasing changed their procedure to streamline their distribution process in a recent Kaizen event. 5. Why didn’t Purchasing notify other departments of their change of procedure? Answer: (Root cause) Purchasing didn’t think it was important for separate departments to depend on specific color copies of purchase orders because all copies have the same information. It was a successful event for the Purchasing department, but caused problems elsewhere. This example stresses the importance for team members in a Kaizen event to consider its effects on other departments and processes. Note that these 5 parameters define the 5 elements used in any process: method, equipment, material, environment, and manpower. This is not coincidental. In short, value stream mapping identifies where non-value added elements and unintended hiccups exist in a process. Each element identified above can be assessed to streamline the process to eliminate non-value added elements, identify and eliminate hiccups and reduce cost. To simplify an event, a value-stream mapping blitz should reduce a standard flow chart to one of the entire series of process cells until each cell is addressed and blitzed. A Kaizen event, or blitz, is a set of specific actions taken with clearly defined goals for improvement. They are small steps; simple, planned actions taken by a group of workers to effect process improvement. A Kaizen event is alternatively called a “blitz” because that term describes its rapid pace to conclusion. Every Kaizen event should have the underlying objective to change the status quo to a state of improved productivity, reliability and profitability. This is not just lean manufacturing, it is lean six sigma; it is a total lean operation in every segment of an enterprise from research and development to shipping. Every future Kaizen event should raise the bar from the previous event. 1. Resources needed for the event will be immediately available. 2. All actions taken should be simple and direct. 3. The event is held to a tight schedule of no more than one week; better if only a few days; therefore, a “blitz.” If a longer schedule is needed, either streamline the event or split it into two or more separate events. 1. All are equal players. 2. All are full participants during the event; all other duties are suspended. 3. All are responsible to achieve the objective. 4. All ideas are considered with equal weight. 5. All commit to eliminate excuse; find answers. 1. Document the current state (status quo). 2. Identify sources of waste. 3. Identify measures of waste elimination. 4. Check the status in play (measure progress by quantifiable metric(s)). 6. Assure that change has occurred. 7. Check the status after change (measure results by quantified metric(s)). 8. Make the change the new standard. 10. Repeat the process, if necessary in a single event and duplicate it in a new Kaizen event. A successful Kaizen event must be planned and executed according to an objective. But of what value is improvement if it cannot be measured to calculate the delta between status quo and the results of change? Note that the above steps highlight at least two opportunities of measurement: the status quo data and the effects of change data. Measurement is an organized, statistical effort to collect data and analyze, predict, and observe quantified results. The collection of data must obtain specific statistical results against specific objectives. The objective of a Kaizen event must be clear and concise. It should prioritize problems, eliminate waste, develop effective training and implementation, and create a workplace culture of continuous pursuit of perfection throughout the organization.9 The goal is to pursue perfection, not necessarily to achieve it. After all, how do we improve on perfection? 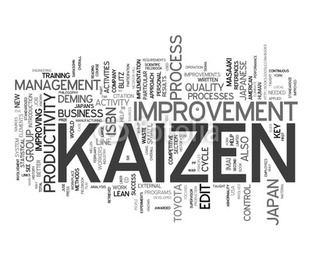 Kaizen is continuous improvement by increased productivity, waste elimination, lean manufacturing, and lean six sigma. It is small, deliberate steps. It is bottom-line practicality we can appreciate. Here is a summary of an actual Kaizen blitz conducted for a plastic injection molding enterprise. The problem was an excessive tooling set-up time imposed on technicians when changing molding tools between production runs. - Rubber cooling lines, color-coded blue for cold water injected into the tool, and color-coded red for hot water egress from the tool. Large bins, one for each color-code hose, contained hoses of variable lengths through which technicians had to sort to find adequate hoses for each tool set-up. -Some tools required oil-cooling hoses, which were contained in a third bin. -Various dedicated hand tools were sometimes required for some mold set-ups in addition to a standard set of tools. By detailed data analysis, it was discovered that variable lengths of cooling hoses from run to run caused variation of molded parts dimensions due to subtle mold temperature changes. Changes to the hose and tool collection procedures were accomplished by obtaining separate plastic storage bins for each molding tool which contained cooling hoses of specific lengths designed to accommodate each tool. 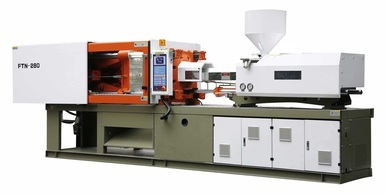 It was also determined that molding tools should be installed only in designated machines. The bin also contained the specialized set-up tools required for each molding tool. Each molding tool delivery to the floor was accompanied by its identified set-up bin containing everything needed to complete that set-up. The results of this Kaizen blitz, which was accomplished in 4 days, reduced average set-up time by nearly 15 minutes, allowed more time for periodic molding tool maintenance after every production run (adding reliability of production performance of every tool), and reduced annual cost waste in man-hours and part variability caused by the obsolete set-up method by nearly one million dollars.